Along the banks of the river and even floating in the water are lots of bookshelves filled with books. The longest river in the world is the Amazon, which is also the name of the world’s largest online bookstore, the famous website and eCommerce store – Amazon. So when you need to remember the names of the longest rivers, you’ll picture a long river in your mind. You’ll imagine bookshelves filled with books in the river, and that will link in your mind to the Amazon bookstore and the name of the world’s longest river. The second longest river is the Nile, which sounds a bit like knee L. Imagine that the bookshelves fall over to reveal an Egyptian pyramid. Climbing the pyramid is a man with a large capital letter L on his knee. It’s a knee L. The Nile river in Egypt is very famous, so you’ll probably associate a pyramid with the Nile straight away, but if not, imagine the man climbing the pyramid with the knee L, and that will help you recall the 2nd longest river – the Nile. The third longest river is the Yangtze river, and that sounds like yank Z. The man climbing the pyramid sees a large capital letter Z on the side of the pyramid and gives it a hard yank. Clearly imagine the man yanking on the Z and that will prompt you straight away to recall the Yangtze river, the third longest in the world. The Mississippi is the fourth longest river. We’ll use ‘mrs sip E’ to remember this one. Imagine that the Z comes off in the climbers hands and he falls backwards, tumbling down he rolls into a lady sipping on a capital letter E, like it was a glass of wine. The lady is married so she’s a mrs. Picture the Mrs sipping on an E – mrs sip e – and you’ll recall the Mississippi river. The fifth longest river is the Yenisei, and that sounds a bit like ‘yen I say’. Yen is the currency of Japan, so we’ll imagine a Japanese yen note with arms and legs, and it taps the mrs on the shoulder, and says ‘I say…’ Clearly imagine the mrs being interrupted by the yen with ‘I say’ and you’ll remember the Yenisei river. Next is the Yellow River. What could we picture for that? Well, how about a yellow river? The yen note suddenly runs away from the lady, and takes a big dive into a river. But it’s not a normal looking river, because this one is bright yellow. I’m not sure why it’s yellow, it just is. Visualize the yen note diving into the cool yellow water, and you’ll remember the Yellow River. The seventh longest river is the Ob River. I seriously could not think of anything good I could link with Ob, so let’s just visualize the letters O and B. The yen note is swimming through the yellow water and bumps into a large OB floating on the surface. They’re bright red and contrast nicely against the yellow water. Picture those big floating letters – OB – and not only will they make you remember the Ob river, they’ll remind you how to spell it too. The next longest after the Ob river is the Parana, which sounds like piranha, the dangerous fish. As the OB is floating along, it’s suddenly attached by a piranha with sharp teeth who takes some big bites out of the letter B. Create a clear mental image of that sharp toothed piranha munching on the B, and you’ll recall the Parana river. The 9th longest river is the Congo, and that sounds like conga drums. The piranha has eaten enough and swims to the side of the river, climbs out, and starts playing a conga drum. He’s really talented, especially for a fish, and gets some great rhythm going. Picture the piranha playing the conga drum and that will make you remember the Congo river. And rounding out our top ten longest rivers is the Amur, which looks and sounds like armor. As the piranha is playing his drums, a knight wearing armor comes out of nowhere, grabs the conga drum and runs away with it under his arm. Picture the knights shiny armor and that will remind you of the tenth longest river in the world, Amur. And there you have it, you’ve just memorized the names of the 10 longest rivers in the world. Now, when you think of long rivers, you’ll picture a long winding river with lots of bookshelves floating along. The bookshelves remind you of the Amazon bookstore, and the Amazon River. A bookshelf falls over to reveal a pyramid being climbed by a man with a knee L – the Nile River. The climbing man yanks on a large letter Z, reminding you of the Yangtze River. The man tumbles down and bumps into a mrs sipping an E – Mississippi. The Mrs is tapped on the should by a Yen note saying ‘I say’ – Yenisei. The Yen note dives into a river with yellow water – the Yellow River. The yen note swims along and bumps into a large OB – the Ob River. Beneath the surface, a sharp toothed piranha munches on the OB – the Parana River. The piranha hops out of the water and begins playing his conga drum – the Congo River. And finally the conga drum is stolen by a knight wearing armor, which reminds you of the Amur River. The 10 longest rivers in the world, memorized in only a few minutes. If you’re a student, there are a LOT of things you need to memorize for exams. You might need to remember numbers, formulas, dates, essays and there are different techniques you can use for each of them. 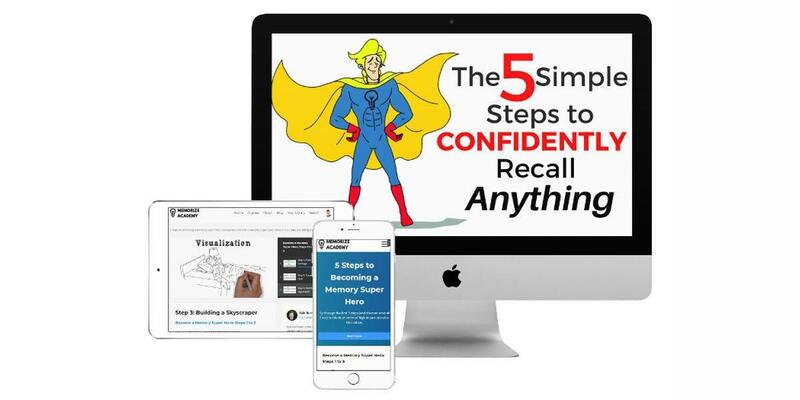 If you’d like to learn some best-practice memorization techniques that will help you crush your exams, sign up for your FREE video training. Please give this video a like and share, leave a comment below and tell me if you can recall the 10 longest rivers right now. There are a lot of variables in measuring the length of rivers, so there's contention about which rivers are actually the longest. For better or worse, this is the list I've chosen to use for this video.